Prezi Viewer - Practice, watch, and present prezis anywhere. Got a presentation but no time to practice? 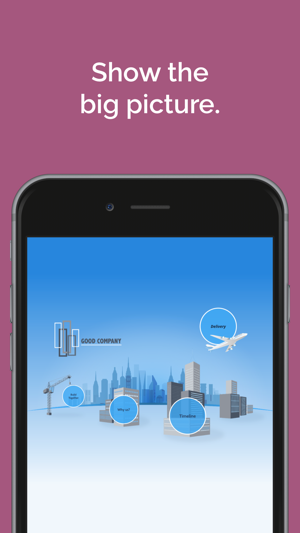 Prezi Viewer is a free app that lets you view and present your prezis wherever, whenever. Traveling to a big pitch or meeting? 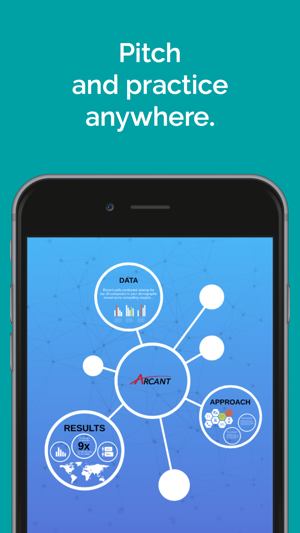 Why not use the transit time to run through your presentation on your phone or tablet? Once you arrive, connect through Apple TV’s Airplay to present live to your colleagues both online and offline. Seated next to a killer prospect on the flight home? You can present your saved prezis offline, so you’ll never miss a connection. 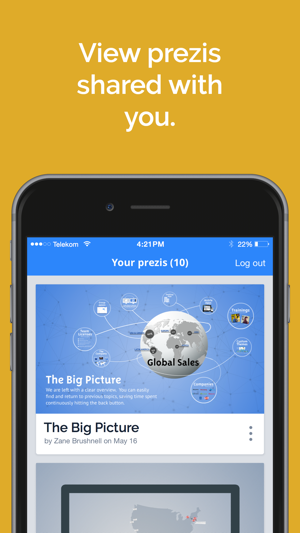 Prezi Viewer for iPhone or iPad means you’re always ready to deliver. Language support for English, Spanish, French, German, Portuguese, Italian, Korean, Japanese and Hungarian. Stability and various rendering improvements. **New**: Ever wish you could organize your presentation library on the go? Wish no more. Now you can copy, rename, and delete presentations right from the Prezi options menu. So, I enjoy Prezi and prefer it to PowerPoint and Google Slides. HOWEVER, the fact that I have to download 963 apps on my desktop and mobile phone AND my iPad but can only edit on my computer is THE MOST ridiculous thing I think I have encountered. Why on earth am I unable to edit on a device that operates as BOTH a laptop and a phone? I would suggest making it clearer that you can ONLY edit on desktops (or laptops? I wouldn’t know because I brought my iPad because it is lighter and more convenient for travel purposes (just the right dimensions for obnoxious food trays) but now I have a 5 hour flight on which I can make no edits on the presentation I have to give unless I hang out in the hotel business center. 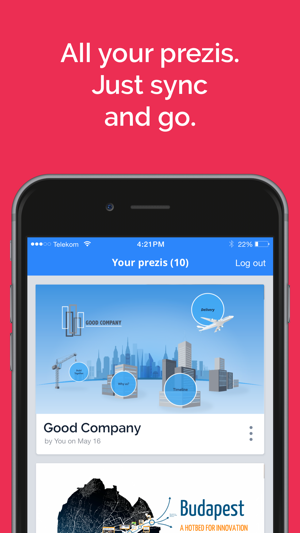 Yes, #firstworldproblems to be certain, but Prezi is a first world app. FIX. THIS. PLEASE. So that we can all be great and enjoy a lighter carry on baggage load with smaller devices and not have to sacrifice productivity. It takes a minute to get used to it switching from PowerPoint, however it sets the standard, you definitely outshine everyone else by far when you're the only one using prezi and everyone else on PowerPoint. I would never go back to PowerPoint, it's kind of like when you switch from windows to mac. Takes a minute to grow on you but once you got it down there is no question that you were living in the past. 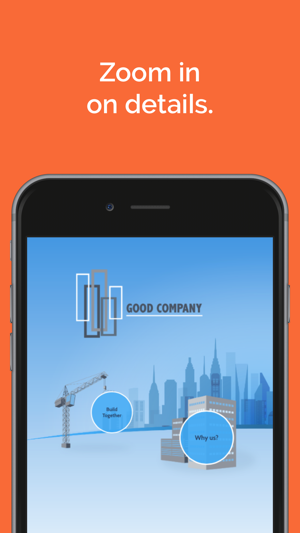 The fact that you don't have to turn around to see the screen because it's on your phone as well and serves as a clicker you feel the difference big time. Also with the animations the audience is definitely more into it. It's the bomb! 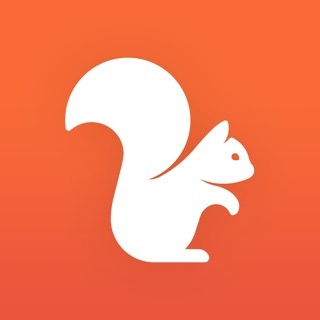 So, I have prezi lite editor and I love it but it is soon going to be put away so I downloaded prezi viewer and as a free app I thought it was the same with maybe more features. This is a lie. You can’t edit! That’s the only reason i got the app, I don’t have access to the website to edit, plus not everyone has a laptop to edit and then go through a whole waiting time for it to go through. Having to edit on an app is sooo much easier and simple! !!!!!! !Please do add an editing feature!!!!!!!! I will soon have to stop using prezi at all if the app i relied on is going to stop being updated, so please add editing to the prezi viewer, it will save you from losing many users.